Having insomnia is one of the most frustrating things that can happen to anyone. I should know; I have had it for years. The difficulty in falling asleep, which results in poor concentration, irritability, and massive headaches drove me to try and find a lasting solution to my insomnia. I stumbled on essential oils and found my therapy right there. Lavender’s calming floral scent, chamomile’s waft of quiet relaxation and the invigorating undertones of petitgrain have helped me cope with the condition. But the kicker came when I found essential oils distiller kits. This kit allows you to steam distill your essential oil straight from the plant, giving more control over the purity of the oil you use. For essential oil to work on any condition you need to use the pure extract and this can be best achieved by steam distillation. How to distill essential oils at home? BONUS – How to make an essential oil distiller from kitchen equipment? This is the process of separating aromatic compounds in plants without destroying the essential components by boiling. The steam water comes into contact with the plant, softening it and opening the microscopic sacs containing the plant’s oils. As the sacs are opened the process applies pressure to extract the oil. Place the plant in a still with water on top of a heat source. Allow the water to steam the plant until you see collectible beads of plant extract form on the sides of the still. Harvest those beads as quickly as possible and store them in a container. The tricky part about getting the correct essential oil distiller is not in the brand, but rather the most effective and appropriate distiller kit. That is why we have taken the trouble to find you the top kits with our below guide. Featuring a distinct copper tubing, this kit is a versatile operation. 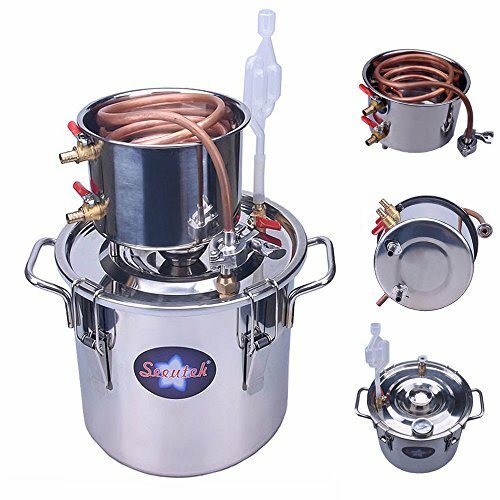 It allows you to jump from distilling brandy or fruit wine to steam extracting pure plant extract and everything purification in between. Two stainless steel boilers are easy to clean and work with in terms of heating up pretty fast. The tubes provide an adequate diameter of 0.47″ generally and 0.33″ on the inside part. This dimension of the tube combined with the induction readiness of the pots ensure that you end up with an excellent harvesting process because of the amount of extract you achieve. The performance is above average, but not what you would call exceptional. If you don’t have high expectations, it will do quite nicely. This is a basic kit. It is ideal for beginners but can prove a bit frustrating for an avid essential oil distillation DIYer. The construction is functional without being complicated. The best thing about it is the conductibility of the two pots. Performance of this kit allows both beginners and seasoned steam distillers to enjoy the process equally. It does not feature very complicated options, but neither is it too basic. It is bigger than the above offering with 5 gallons to work with. This allows you to produce more extract in a shorter amount of time. The copper cools the extract fast so that you do not lose the essence of the oil. Aesthetically, this kit looks pretty suave. Stainless steel gives it a clean look with a shiny finish. Think of a good looking kit that would be a great addition to your essential oil extraction process. It is above average in its workings, so you can use it even if you are not a beginner. 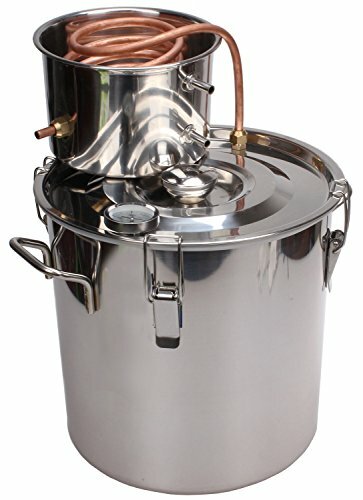 This is a beautiful DIY home distiller, excellent for plant extraction, especially if you want to harvest more extract. It gives you 10 gallons. The kit comes with a thermometer that gives you both Celsius and Fahrenheit options. The bigger pot extends nicely over the drip snout of the smaller pot facilitating very efficient harvesting of your extract. 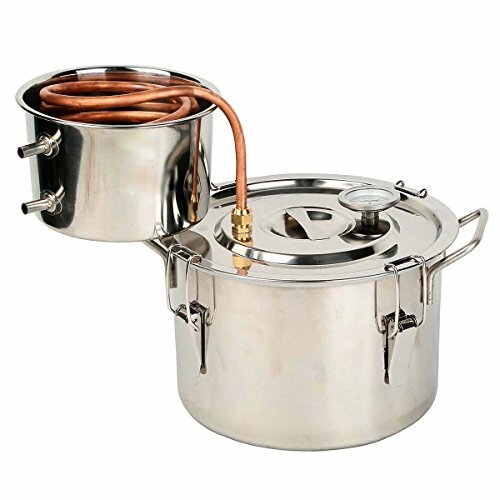 The thickness of the pots is excellent for heating up gradually, allowing you to create the potent extract. The look of this kit is very clean and efficient. It is the epitome of functionality and practicality in terms of cleanliness and conducting of heat. This kit is excellent for continuous use without compromising on the extract. It is stout and long-lasting, allowing you to get comfortable with it and to enjoy the process of distilling your essential oils. It is easy to use and has been constructed using non-toxic materials. With a built-in thermometer, you can easily monitor the temperatures you are working with even as you run the distillation process. This is crucial as monitoring the temperature ensures you end up a high-quality extract. The heat induction of this kit is decent and the design is well thought out although simple. As an all in one kit, it works very well. All the parts are made from food grade material which dispels some claims that there is the lead in this product. The packaging and shipping process is outstanding. The still comes as a well-padded package and some consumers have even received it days in advance of the actual shipping date. Beginners will find it friendly since they can use the big pot for all the process. The finish is a combination of stainless steel and copper. The ease of use and affordability of this kit makes it quite popular. It works like a charm and is great for beginners trying distillation for the first time. Although the still works well the materials are not built to last, so if you have a lot of distillation you may find yourself replacing it sooner. Having said that, it is an effective kit to have. 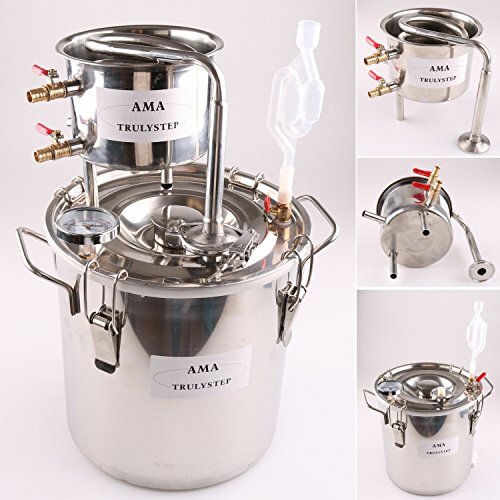 This home distillation kit will produce 2 gallons of whatever extract you are working with. It is made from stainless steel, which means long service life and ease of maintenance. It is very pliable, conducting heat quickly and easily. It maintains the heat evenly so you get a good extract harvest throughout. The seals are quite effective at keeping the steam from escaping, unlike other offerings that come with mediocre seals. It comes with recipes, but not instructions of how to prepare the said recipes, so you have to figure that out yourself. It is very versatile in use. As easy as it for you to make essential oils, it is also just as easy to distill your water with this kit. One of the best uses of this kit is desalinating water when you live in a storm-prone area. The finish is shiny with well-done seams and rivets in place. It looks good and performs just as well. The beauty of this kit is its functionality and practicality. 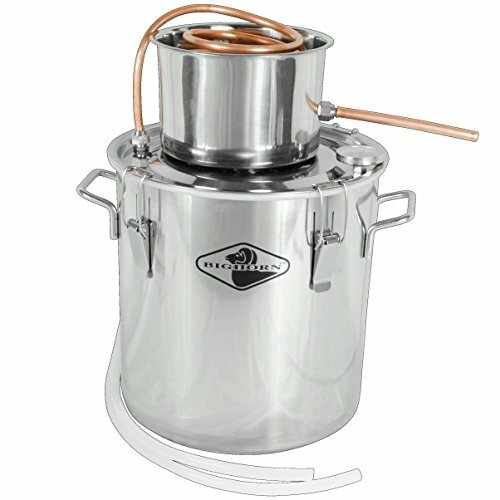 It is a cool device that works well for beginners and novices at distillation. Seasoned distillers will find it frustratingly lacking. It is really a still for having fun until you get into serious distillation; then you will need a more advanced kit. It is imperative to clean your kit before using it for your distillation. You have to ensure that you clean the kit thoroughly upon purchase so that your extract remains unaffected and pure. Essential oils distiller kits are expensive to purchase and the same process can be achieved using kitchen equipment. Place the plant matter into the large stock pot (distiller base) together with some water and begin heating on a stove top. Make sure the temperatures are just enough to produce steam without boiling the plant. Cover the pot with a lid and place ice on top of the lid. This helps the essential oil extract that collects on the lid following the steaming to cool down into collectible residue. The glass bowl should be already placed into the distiller base to catch the essential oil extract as it drips off the condenser lid. Ensure the collector is slightly raised above the water level in the distiller base. You can use an insert to achieve this. The extraction of essential oil is a fun and almost therapeutic process. Having the right equipment is an integral part of making it successful and a joy. With the above mentioned essential oils distiller kits you are well on your way to enjoying your favorite oils on a regular basis and independently.